A decent retread of the usual story where a girl witnesses something and two hitmen come after her. 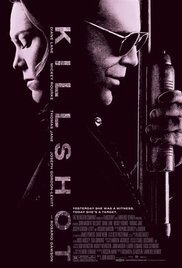 I knew Killshot had a very poor theatrical release and was pretty close to a straight to video situation, but I still wanted to see it for a number of reasons. First and foremost, was that it was the movie of what was probably the most famous Elmore Leonard book. I love Tarantino and I know full well that one of his biggest influences is crime author Elmore Leonard. Tarantino’s Jackie Brown and Soderbergh’s Out of Sight, were both from Elmore Leonard books. But that was 1997 and 1998 at a time when Hollywood’s top directors were making those kinds of movies. The second reason I wanted to see it was because of the cast. Mickey Rourke, Joseph Gordon Levitt, Diane Lane, and Thomas Jane. I happen to be a big Thomas Jane fan. That’s not to say that I love everything he’s done or have seen everything he’s done or have any interest in one day seeing everything he’s done, but he’s a great B movie actor. Deep Blue Sea is a perfect example. So is his version of The Punisher, which I happen to think is a lot of fun. Now Thomas Jane has his own show on HBO called Hung, about a male prostitute, and that show is also a lot of fun, mostly because of the comedic timing of Thomas Jane. The rest of the cast members are just okay. Mickey Rourke and Diane Lane have certainly been in some crappy films over the years, but Joseph Gordon Levitt is the other one to really watch. And in this movie he finallly gets the chance to act. He’s a very likable actor, but too often he’s just playing another version of himself. That’s how I felt about him in both 500 Days of Summer and also Inception. Both good movies, but not much acting going on from this young fellow. Here in Killshot, which is by far the worst of those three movies, Levitt gets his chance to really act. He’s a bit of a psycho, a young buck who thinks he’s on top of the world and can do whatever he wants. But deep down, he’s not really confident at all, and that explains why he is constantly talking. He’s a simple-minded criminal and he meets up with ex-mafia hitman Mickey Rourke and together they form an unlikely partnership. 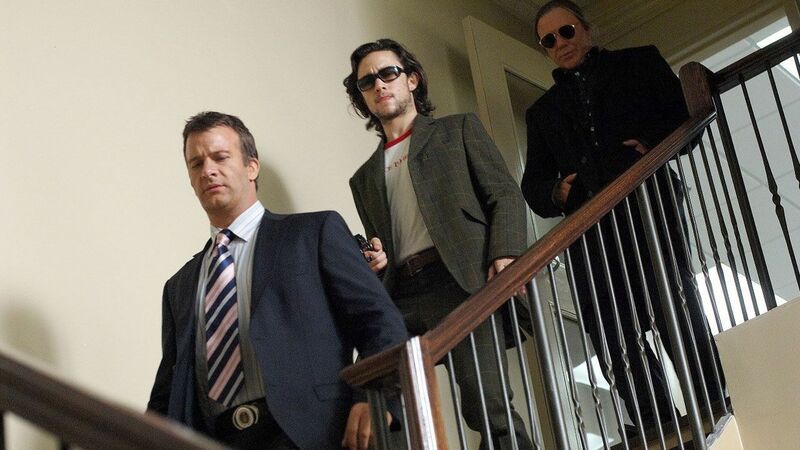 Before we meet Levitt, the movie really focusses on Mickey Rourke. He’s the star of the film, which is a strange move for any movie, because he’s also the villain. We start on a flashback of Rourke pulling off a robbery with his two brothers and then move to him doing a job for the mafia that he screws up. It’s a matter of him playing by his own rules and them not liking his rules at all. So now they’re out to kill him. One of the biggest problems of the movie is that this plotline about the mafia having it in for Rourke is pretty much dropped all together. The movie becomes about Rourke and Levitt going after Thomas Jane and Diane Lane, and that’s all well and good, but the mafia should still be a part of the film, maybe in the background, returning for the end to put Rourke in his place. The FBI gets involved with Jane and Lane, because that couple has seen Rourke in the area and a high profile mafia murder has taken place in the area, and the couple can testify that Rourke was in town. And all of this is interesting. But then the movie lets it go. The FBI, just like the mafia, completely disappears from the film. Instead of bringing in all the strands and plotlines that were running, like True Romance or Enemy of the State, or The Firm when Paul Sorvino and the mafia are finally brought into town, this movie goes the opposite route and drops them all. Suddenly it’s just about Rourke and Levitt vs Thomas Jane and Diane Lane, and it becomes a very typical sort of movie. The movie isn’t bad. Having such strong actors involved (including Rosario Dawson as Levitt’s girlfriend), pretty much ensures that. But it’s not all that great either. Mainly because it doesn’t explore new ground. Yes, it’s cool that the villainous hitman is the star of the film, but as the movie goes on it starts to fade. He ends up taking a backseat to the couple and this movie sells itself out to become the same as all the rest.